The Library on the ground floor of the White House on Dec. 2, 2015, in Washington as Christmas decorations for 2015 are unveiled. Four designers who have clothed Michelle Obama also designed and decorated three rooms on the ground floor of the White House for Christmas. Carolina Herrera was responsible for the China Room, where presidential china place settings used throughout history are displayed. 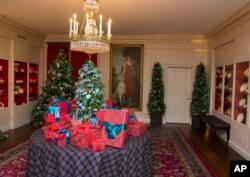 The China Room in the White House on Dec. 2, 2015, in Washington as Christmas decorations for 2015 are unveiled. The Vermeil Room went to designer Duro Olowu while the design duo of Carol Lim and Humberto Leon handled the library. The first lady has worn clothing by all four designers. 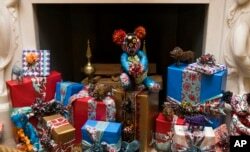 Decorations in front of the fireplace in the Vermeil Room at the White House on Dec. 2, 2015, in Washington as Christmas decorations for 2015 are unveiled.